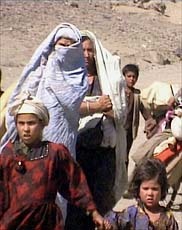 Refugees in northern Afghanistan in a documentary made before the current war. Get a weekly roundup of reviews and news by e-mail every Friday. t one point in "Jung (War) in the Land of the Mujahedeen," Gino Strada, an Italian doctor whose attempt to build a hospital near the front lines in northern Afghanistan is the the focus of the film, remarks bitterly that the conflict in that country is a "forgotten war." That this is no longer the case does nothing to diminish the relevance of this unsparing, heroic documentary by Fabrizio Lazzaretti, Alberto Vendemmiati and Giuseppe Petitto, but rather makes it essential viewing for anyone who desires a sense of the finer human grain of a war that now commands the attention of the world as never before. In cinematic terms, "Jung" (which means war in Dari, a predominant Afghan language) is evidence of the continued vitality of the cinéma vérité tradition. Without narration or talking-head briefings, the film plunges, with Dr. Strada and his companions  Kate Rowlands, a British nurse, and Ettore Mo, an Italian journalist  into the misery and chaos of combat and its aftermath. The most eloquent testimony to the prolonged agonies of Russian invasion, fratricidal civil war and Taliban rule comes from the people of Afghanistan, who speak with dignity and forthrightness about the brutality of the last two decades. Though the film's images are heart-rending  small children whose limbs have been blown off by land mines, sick and wounded soldiers in crowded casualty wards, elderly people who find themselves homeless and destitute  the filmmakers are not soliciting our pity. Like Ms. Rowlands, Dr. Strada and Mr. Mo, they practice an intrepid humanism without borders and without illusions. The Northern Alliance fighters whom the filmmakers talk to  including Ahmed Shah Massoud, the legendary Lion of the Panjshir who was assassinated in September by men said to be linked to Osama bin Laden  are as ruthless and determined as their unseen foes. They see themselves as holy warriors fighting a patriotic battle against an enemy they describe as the tool of Pakistan, Britain and the United States. One imagines that  at least in terms of the latter two  their thinking has changed recently. The film chronicles, in a series of rough, disjointed sequences, two visits to the area north of Kabul, in 1999 and 2000. Dr. Strada's purpose in coming to Afghanistan was to establish a hospital in the city of Charikar, and his gruff impatience is as crucial to his project as his compassion. He manages to get medical supplies from Italy, to ban firearms from his buildings and to persuade a militia commander to move a column of tanks parked nearby that might have made the hospital an irresistible military target for Taliban artillery. He and Ms. Rowlands recruit Kurdish doctors and hire refugees to work as orderlies and attendants. By the end of "Jung," they seem to have succeeded in creating a relatively peaceful and stable oasis in the midst of catastrophe. "Jung" can hardly be called optimistic, but neither does it invite despair. The filmmakers leave little doubt that the Afghans have been brutalized by war, but suggest that they do not seem to have been broken by it. One of the most moving passages in the film records the death of an elderly man, not because of the war but from a vicious form of melanoma. In the midst of caring for the wounded, the hospital provides him terminal care, and he dies with his grandchildren around him. The tears they shed at his funeral carry a curiously hopeful message: this quiet death, in the midst of so many hideously unnatural, unspeakably violent ones, holds out the fragile promise that the normal life the Afghans long for may somehow be possible. Directed by Alberto Vendemmiati and Fabrizio Lazzaretti; in Dari (an Afghan language) and Italian, with English subtitles; director of photography, Mr. Lazzaretti; edited by Giuseppe Petitto; music by Mario Crispi; Line Producer, Mr. Petitto; Executive Producer, Lorenzo Torraca; released by Human Rights Watch International Film Festival in association with Karousel Films. At the Cinema Village, 22 East 12th Street, Greenwich Village. Running time: 114 minutes. This film is not rated.